Discord – someone would say it has been the very badge-hunters tool which ruins experiences of non-badge-hunters in sas4. Don’t worry, Discord is just a tool, it doesn’t work without human resources in it. Just ignore those idiots and make a good use of discord. Everyone can easily obtain a chat server there. Population of SAS4 players is only a thousand per day. A party of 2-5 people would be enough to drive championship diamonds. Be careful; there already exists multiple channels around SAS4 in whole of discord, we have to win against all of them to have the greatest power. The more members you get, the easier you can drive championships. It is a good idea to pretend a NK-official channel, while nothing is NK-official one in discord. Let’s invite Aaron and other persons concerned with NK to your channel and show up their name on the screen. 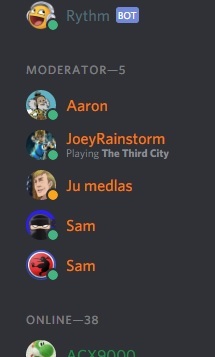 Their names will secure the position of your channel in discord. Don’t forget to give them a moderator role. At the same time it’s better to hide your name in the column of moderators, if you are a person of bad repute in SAS4 players.